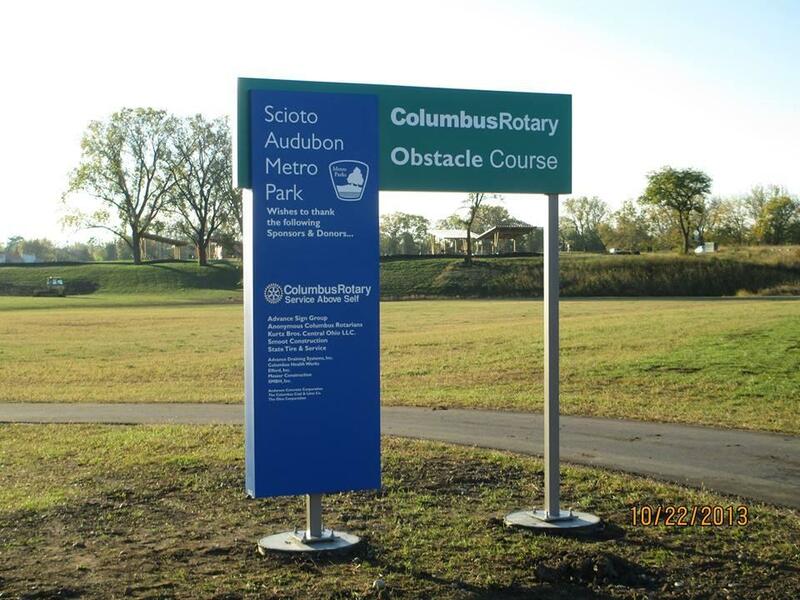 After months of planning, designing and constructing, the Columbus Rotary Obstacle Course at Scioto Audubon Metro Park will open to the public on Saturday, October 26. Representatives from Columbus Rotary, Metro Parks, Ohio State University ROTC and other young professional groups will compete in a Challenge Team Run following the grand opening ceremony that begins at 10 am. The free course features nine challenging obstacles and a half-mile trail designed to meet the recreational and competitive needs of youth 14 and older and active adults. The stations include: a tire run and flip, a tunnel crawl, a cargo climb, a balance beam, a belly crawl, monkey bars, an over/under, a climbing wall, and a log run. Columbus Rotary secured more than $100,000 dollars in donations and in-kind services for the project and several members along with representatives from other service clubs invested more than 300 hours of work on the design and construction of the course. “This project started in 2012 as one of many services projects celebrating Columbus Rotary’s Centennial Year,” said, Columbus Rotary President Steve Heiser. “Fellow Rotarians were enthusiastic and committed wholeheartedly to helping Metro Parks enhance the outdoor amenities at Scioto Audubon that ultimately contribute to the health and well-being of the Central Ohio community. Located just outside of downtown Columbus, the 122-acre Scioto Audubon Metro Park is a mecca for outdoor enthusiasts. The park features 3 miles of trails, a 2-acre dog park, frontage along the Scioto River for boating and fishing, various play structures for kids, the Grange Insurance Audubon Center and the a 35-foot high climbing wall, the largest free outdoor climbing wall in the country. “Thanks to the generosity of Columbus Rotary in taking leadership in the design and construction of the obstacle course and trail, active adults and teens now have another opportunity to enjoy the outdoors, challenge themselves while improving their health and, best of all, have a lot of fun,” said Metro Parks Executive Director John O’Meara.